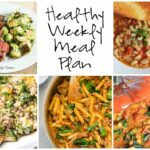 Mexican Turkey Tortilla Casserole and Lemon Roasted Shrimp and Asparagus are just two of the delicious recipes on this week’s Healthy Meal Plan. April is here! We survived March and it was just as cold and wet as I anticipated. I think yesterday it poured for 24 hours straight. I am so ready for the spring and hopefully some sunshine! I still haven’t been cooking that much. I am dying to get back into and my kids are too. They are used to me cooking all the time and the takeout might have been fun in the beginning, but they are definitely over it. I can totally understand. Hopefully the house sells soon and life can go back to normal. But these are all good things to complain about, right? 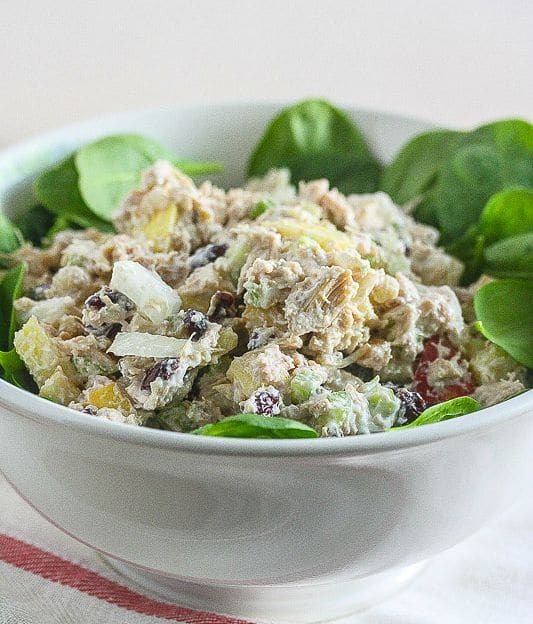 Healthy Chicken Salad from Lauren Kelly Nutrition. 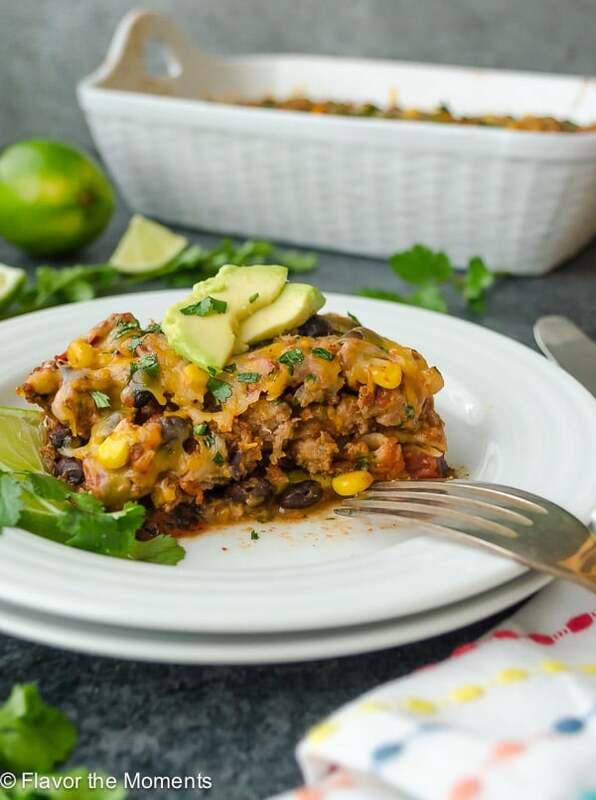 Mexican Turkey Tortilla Casserole from Flavor the Moments. Prep Ahead: The entire filling may be made in advance, and even frozen. Assemble before baking! 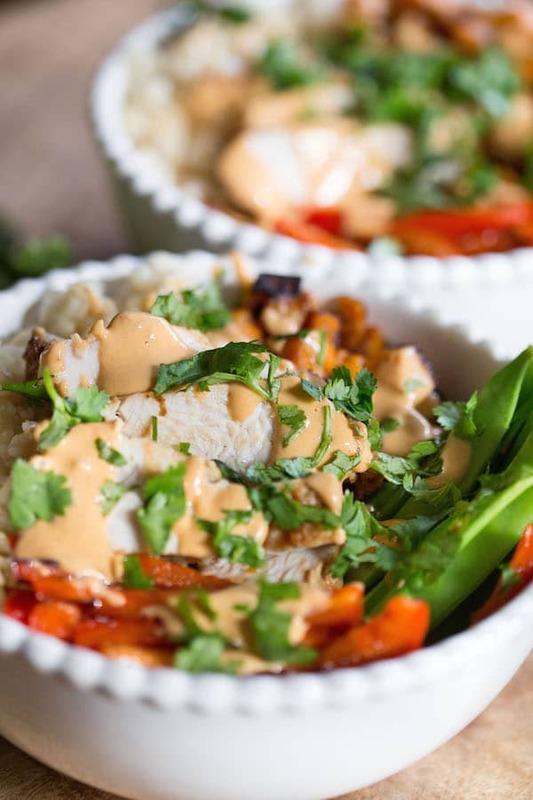 Thai Peanut Turkey Bowls from greens & chocolate. Prep Tip: You can make the rice and sauce in advance. 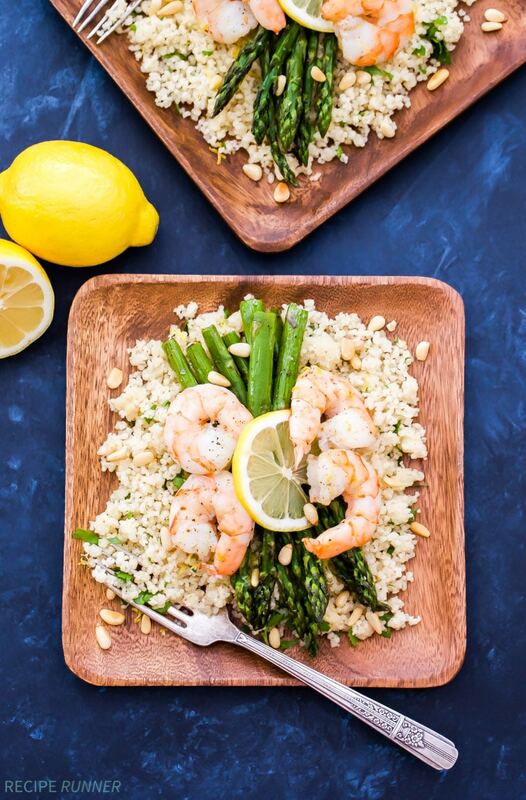 Lemon Roasted Shrimp and Asparagus from Spoonful of Flavor. 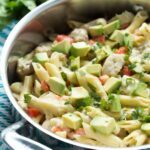 I am so intrigued by that vegetable pesto! Let’s not forget our handy grocery list! I am so ready for warm sunshine days! SO much gloom and rain here! Great menu, once again! 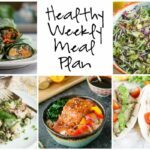 We made a chicken salad for this week also. 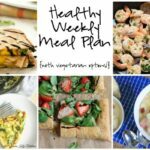 What a very flavorful week you got scheduled here! Boy am I hungry!! 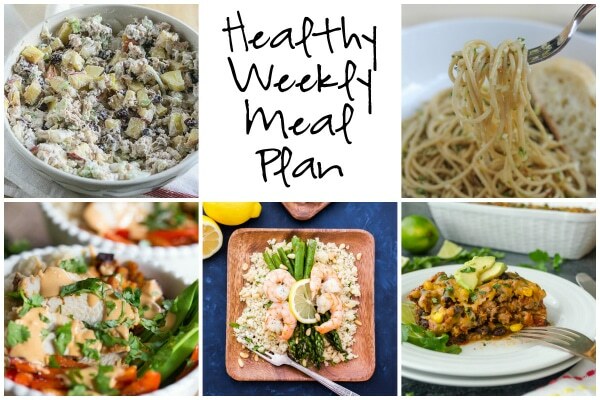 Those Thai Peanut Bowls sound amazing! So much deliciousness here! 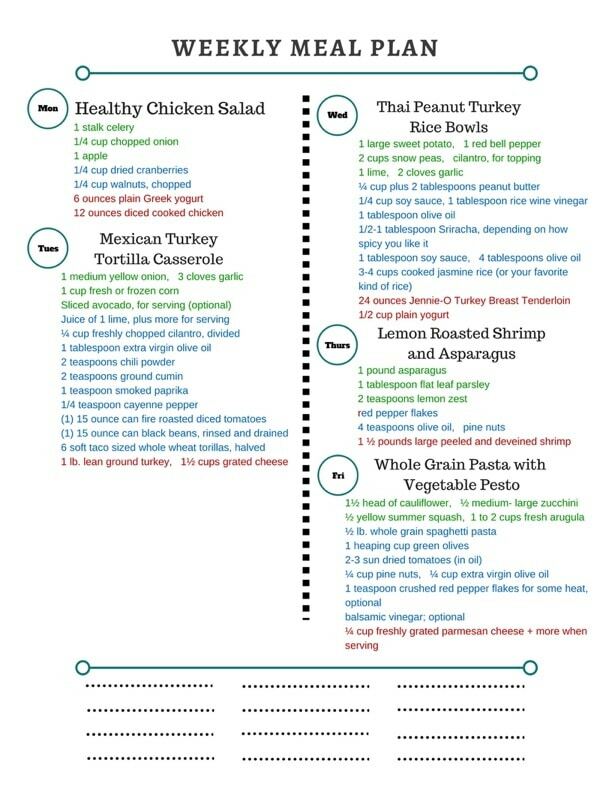 I love how everything is healthy but doesn’t skimp on the flavor. Loving all these fresh, bright flavours for spring… this is exactly what I’m craving! Now if only the dang weather could start cooperating and stop with these sub-zero temperatures. I am so ready to put away all my boots and jackets and scarves! Wow! Everything looks great this week. I love a good healthy chicken salad in the summer. I really like that the Mexican Turkey Tortilla Casserole and be made ahead and frozen for later. I hope that your house sells soon. Have to “live” in your house without having it looked lived in is a challenge! 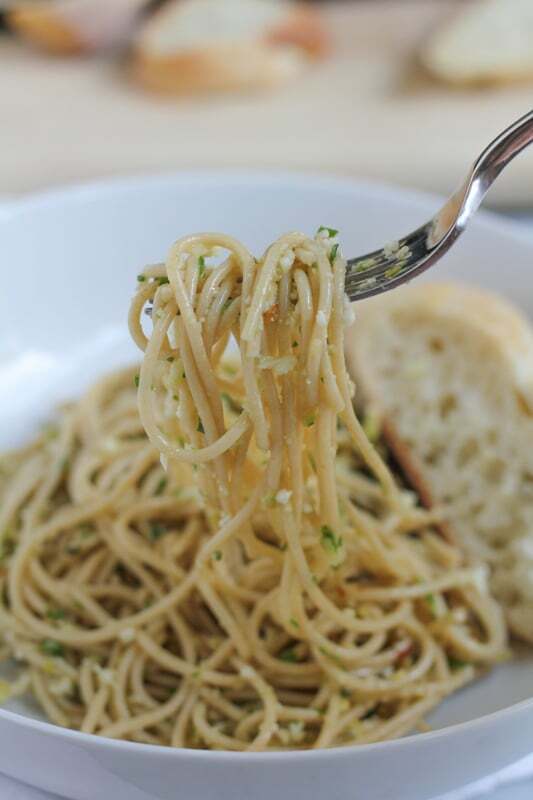 I’m on such a Pesto kick right now! Sounds so good!